Super Paint is a free painting tool for your Windows 8 and 8.1 computer. The painting tool is more than just a simple painting app. It has some distinctive feature which makes it a great painting app for you to work on. The app is not only for the kids but youngsters can also work on this and can practice different things. Utility tool: Select, crop, zoom and screenshot. Text tool: Font family, fill, outline, blend, opacity and font size. Brush tool: Pencil, pen, calligraphy, crayon, streamer, paintbrush, arrow, line, path, spray paint, stamp, chrome, fur, sketchy, web and spirograph. There is fill, blend mode, opacity, line width and spread as settings for this tool list. Shape tool: Square, rectangle, regular polygon, triangle, star, burst, circle, ellipse, pie, ring, radial burst, gear, spiral. Settings for these include fill, outline, blend mode, opacity, sides, slope and cutout. Clip art tool: Different clip art of animals, plants and people. The settings for these are blend mode and opacity. You can load your own image as well. Floodfill: The settings for this are fill, blend mode, opacity, tolerance and contiguous. Eraser tool: The settings for the eraser are opacity, size and blur. Menu of the Super Paint includes settings, layer, history, file and export. Settings display the settings that are related to the tools chosen. Layer shows the designs you have created, automatically for each new elements and object a new layer is created. History tells each and every movement or selection you have done on the canvas. File menu includes creating new file, uploading new image or placing image into canvas. Re-sizing layout or changing the background. 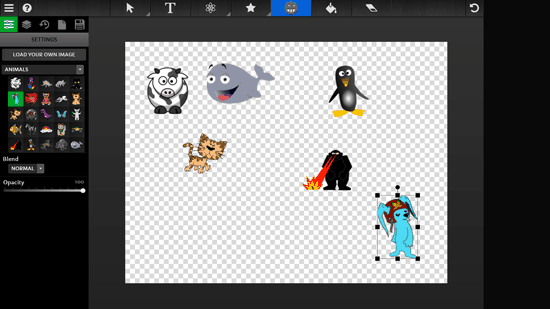 You can also check out paint pad and inspirARtion painting apps for Windows 8. The app lets you export the created graphics to the computer by using Download button from export menu. You can also print or share the graphics using the other two menu options. The app works flawlessly on Windows 8 and 8.1 PC and is capable of creating graphics of any resolution.